Chinatown NY is the city that time forgot. Though the rest of the world and the noisy clanging of the big cities has escalated and gone forward into the future, Chinatown has stubbornly resisted change and modern updates. And why should it? From the red confetti to the glitzy old world charm of China, this city proudly remains and will always be a foreign nirvana to the rest of the world. 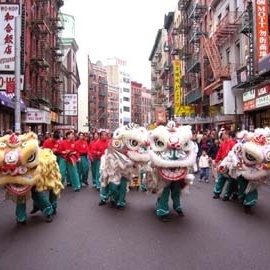 Located on the lower east side of Manhattan, New York's Chinatown is the largest in the U.S. This widely populated area also boasts the proud heritage of Filipinos, Vietnamese, Burmese and Puerto Ricans. And this sprawling neighborhood continues to grow and stretch with its abundant fruit and fish markets, and shops galore down its overcrowded streets of ethnic diversity. Walking down the winding streets of Chinatown, you're sure to take in the aroma of noodles, incense and fresh fish. Ahhhh, your senses come alive here! Dim Sum, anyone!